Editor’s note: This blog was posted a year ago but remains relevant, especially after the recent havoc of Hurricanes Florence and Michael. Thousands of federal, state, and private agencies have been deployed to areas that were impacted by hurricanes Harvey, Irma, Maria, and Nate. These first responders are there to help the people in the storm’s path. However, there is another group of responders that go into storm-ravaged towns to aid the trees: the Urban Forest Strike Teams (UFST). This 10-year-old program is a nationwide collaborative effort among state forestry agencies funded and trained through the U.S. Forest Service’s Urban and Community Forestry Program. Since 2007, the Southern UFST has been activated 12 times and mobilized across the South in response to hurricanes, tornadoes, and ice storms. The catalyst for the creation of UFST was Hurricane Katrina. Widespread tree damage prompted the international Society of Arboriculture, Davey Resource Group, and USFS to deploy certified arborists into at least nine communities along the Mississippi/Louisiana Gulf Coast. State forestry agency urban foresters were frustrated that damaged but viable trees were being cut down and trees that posed a high risk to the public remained standing. The lack of an assessment strategy or trained staff hindered their ability to offer needed assistance to impacted communities. Urban Forestry Coordinators of Virginia and North Carolina – Paul Revell and Leslie Moorman – reached out to USFS Southern Research Station (SRS) for assistance. In 2007 Dudley Hartel, SRS’s Urban Forestry South center manager, and Eric Kuehler, technology transfer specialist, developed the first UFST training program in collaboration with state forestry agencies. A UFST is comprised of highly-trained specialists, including Certified Arborists® and foresters, who conduct damage assessments and determine whether the storm-damaged trees pose risks to the community. 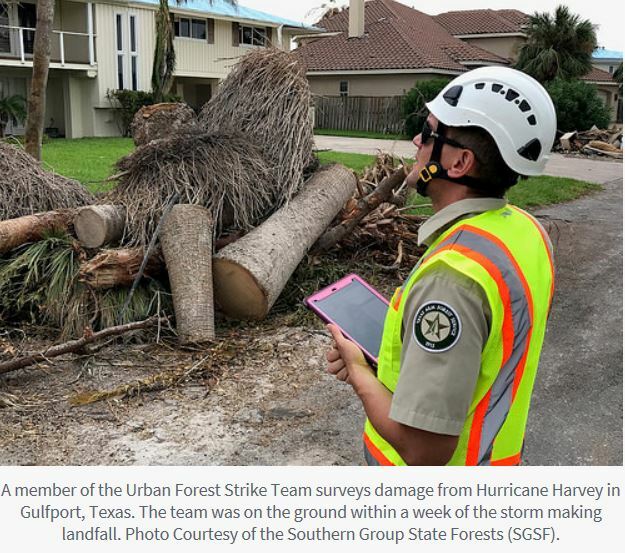 The UFST walks the city streets, parks, and other public property; evaluates damaged trees; and enters GIS data to support mitigation and recovery. This real-time data provides the city with information on which trees were impacted, where they are located, the extent of the damage, and whether the damaged trees pose a risk. UFSTs also provide communities with the information necessary to apply for FEMA public assistance and debris removal, as well as connecting communities with potential partners to help replant a community’s forest.